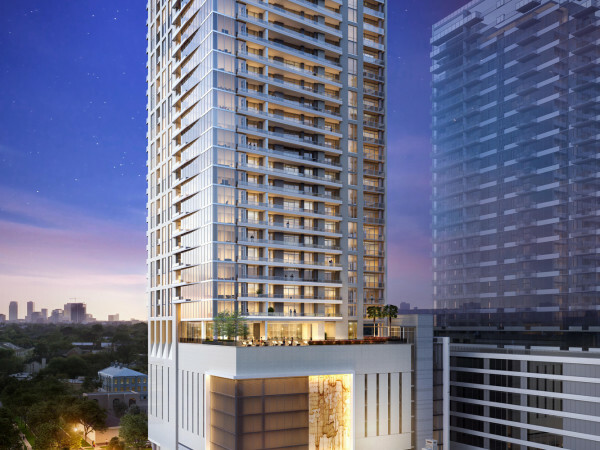 Soaring 46 floors above downtown Houston and set at an angle that maximizes both street space and sky views, The Preston is out to change the way Houstonians think about downtown living. From its perch on Preston and Milam streets, the new tower blends the energy of life in the city with the luxuries of a grand hotel. A partnership between Hines, one of the world’s most dominant real estate firms, along with Cresset Wealth Advisors and Levy Family Partners, The Preston is a whole new level of swank. But make no mistake: this isn’t just another amped-up amenity apartment building. 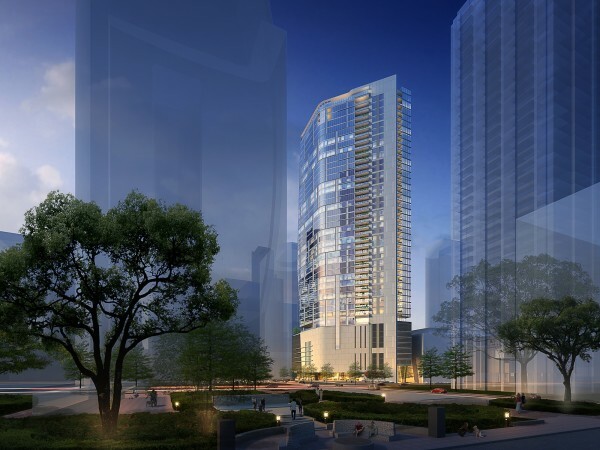 The high-rise, with 431,952 rentable square feet across its 373 luxury residences, will be the tallest residential structure in the city core — stretching 46 stories. There are 10 penthouses sprawled across floors 45 and 46, with residences that range in size from 1,739 to 2,927 square feet, boasting large outdoor living spaces, freestanding bathtubs, and ultra-luxurious modern European finishes. Some will even have outdoor kitchens with gas grills and contemporary indoor fireplaces. There will electric vehicle charging stations in the parking structure, guest suites for overnight visitors, a wine tasting room, a pet spa, and a bike storage and repair shop, among a host of other high-end offerings. And then, there’s the view. 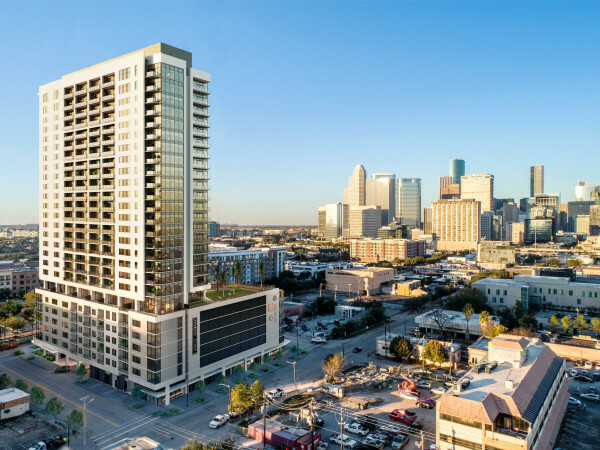 Positioned diagonally on the north side of downtown, The Preston will offer panoramic views of the Central Business District, Market Square Park, Sesquicentennial Park and Buffalo Bayou, as well as long views to The Heights area and beyond. Renderings show a skyscraper with a chunky, funky geometric base, giving way to a sleek, skinny glass tower that rises above the action on the city streets below. If location is the key phrase of real estate, The Preston looks poised to capitalize on its geography. Residents can enjoy walkable access to all the amenities of the city center — from the Central Business District, Theatre District and Historic District, offering easy access to major urban, cultural and sports facilities such as the Buffalo Bayou Park system, Discovery Green, Jones Hall, The Wortham Theater Center, Sesquicentennial Park, Minute Maid Park, and the Toyota Center. More than 50 bars and restaurants, including Bravery Chef Hall, Coterie and the soon-to-open Lyric Market, are also within walking distance of the new address. The Preston’s residents will have access to an array of outstanding amenities. In addition to the ones above, the new residence offers a 24-hour concierge; valet parking; 46th-level sky amenity deck capturing panoramic views of the skyline with private resident dining room and catering kitchen; 10th level zero edge pool surrounded by cabanas, daybeds, a yoga lawn and private terrace; state-of-the-art gym with on-demand virtual fitness classes; coworking and conference spaces; multiple social lounges with complimentary beverage and coffee bars; and 6,800 square feet of curated street-level retail and restaurants onsite. Construction begins next month with completion slated for the third quarter of 2022. Pre-leasing will begin October 2021.